This post by my boss Will Mancini on how churches can leverage trends in retail brought to mind some research I had done a couple of years ago about the connection between retail stores and the church. Paco Underhill, the founder and CEO of Envirosell, Inc. wrote the book on the science of shopping – literally. Why We Buy, originally written in 1999 and updated in 2009, is a witty and pragmatic report from the retail trenches on consumers’ tastes and habits — what makes them tick, what happens to people in stores, how to influence or change customers, and how and why customers change stores. Envirosell is a research and consulting firm that advises a blue-chip collection of Fortune 100 companies seeking to understand the behavior and motivation of the contemporary consumer. Envirosell films, records, and follows 50,000 to 70,000 shoppers through their retail experiences in stores, banks, and public spaces. Underhill uses video, trained “trackers” (researchers who discreetly cruise the aisles tracking shoppers and making notes on their activities), and photo analysis to help retailers understand why consumers buy – or don’t. Here’s a quick story that shows how Underhill and the Envirosell team’s research documented, then changed, the way many stores market a common item today. A large company owned a chain of drugstores throughout the country. In efforts to understand buying patterns, they had Underhill study a typical store near their headquarters. It was located in an enclosed regional mall in the Northeast. The store’s sales were good overall, but in one category – analgesics – it was underperforming. Video study showed that the closure rate – the percentage of shoppers who bought – was below expectations. Plenty of customers picked up the packages, read the labels, but didn’t complete the purchase. The company’s previous studies had shown that the conversion rate was high, so there was another factor at work. Over the course of three days, a pattern emerged. The aspirin was displayed on a main aisle, on the path to some refrigerated cases of soft drinks, which tended to draw many customers to that section of the store. The main customers for the cold drinks were teenagers, many of them mall employees on a quick break. They would rush down the aisle, grab a drink, and hurry back to the front to checkout. Along the way, they would have to brush by customers – often median and senior adults in the aspirin aisle. The video studies showed that many times the aspirin shoppers would simply stop their browsing and walk away empty-handed. The primary learning was that a store has more than one constituency, and it must therefore perform several functions, all from the same premises. Sometimes those functions coexist in perfect harmony, but other times they clash. Hello? Does this sound like your church? Do you not have various constituencies “competing” for the same space and resources? Does it often seem like a tug-of-war with no winners? The solution for the drugstore chain? They moved the aspirin to a quieter section of the store, where sales rose 15% immediately. They also located a selection of cold drinks and snacks close to the front of the store – a move that has now become industry standard. That’s what the science of shopping can teach the church. People have habits on how they move in spaces, interact with others, and make decisions. Why not study the retail world and apply those principles to the design and operations of our churches? 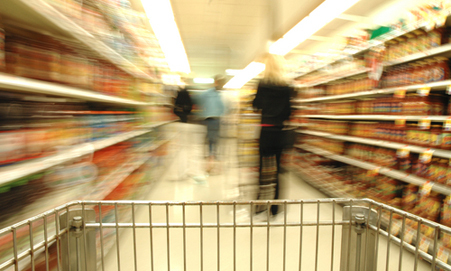 What are some retail lessons you have observed and have implemented at your church? This entry was posted in BookNotes, Design, Guest Experience and tagged Guest Experience, hospitality, Paco Underhill, shopping, Why We Buy. Bookmark the permalink.